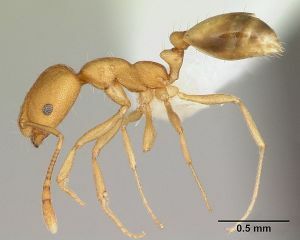 It is a small ant, which is yellow or light brown in colour. It is nuisance pest and a major indoor notorious insect, which is especially found in hospitals. It’s scientific name is monomorium pharaonis, it is 0.2 cm in length. Pharaoh ants have a casual reproduction system like other ants, they grow from egg to adult almost in 38 days. Female ants live 4 to 12 months, and workers live approximately to 10 weeks. Small amber-coloured workers are the best sign of their infestations as they forage along surfaces. Pharaoh ants have a classical chemistry, they have multiple queens and when they are disturbed they move from place to place to move their colonies. Workers grow from eggs to adults in 38 days and may live approximately for nine to 10 weeks. Queen Pharaoh ants are healthy than other Pharaoh ants and can live approximately for four to 12 months, but not male Pharaoh ants as they die within three to five weeks of mating. Pharaoh ants make their new colonies by budding. Budding means that a small strength of workers and a single queen migrate another place from their old colony to start a new colony. Pharaoh ants can be harmful, when they are countless in number. In that case Pharaoh ant control should be necessary as they build nests in walls, in cabinet voids, baseboards, refrigerator insulation pipes, the hollow rods of curtains, the foldings of clothes and other undisturbed dark spaces. In controlling Pharaoh ants, it is advisable to seek professional help. Exopest Pest Control is remarkable for Pharaoh ant control services. Contact or Call us 604-760-1542. There are numerous ways to control Pharaoh ants but the best way we recommend is baiting that we learnt from our extensive experience, but ants always don’t like same bait so please call a pest control professional to deal with this Pharaoh ant control issue. We use different kinds of professional grade bait (some are based on soya, sugar and protein) . Please call Exopest Pest Control professionals we are here to help you 24/7. Exopest serves throughout Lower Mainland BC, Canada. Request a FREE ant control quote!